Chris Hayden was born to a pair of Starfleet Intelligence officers on Earth in 2343. Growing up in a family that excelled at keeping secrets it was no surprise that Chris picked up the talent eventually excelling at it like his parents. He elected to follow in his parents footsteps and enrolled at Starfleet Academy at the age of eighteen with the hopes of following in his parent's footsteps. After getting turned down by Starfleet Intelligence he was recruited into Section 31 his junior year at the Academy by his Mother who was also a member. Chris was not called on to do much until 2374 when Section 31 arranged his transfer to Starbase 375 while it was Admiral Ross' base of operations in the Dominion War. Unfortunately for section 31 Deep Space Nine was retaken by the allies and the alliance returned to Deep Space Nine. After the war he was transferred to Starbase 211 which was near the Cardassian border. The juiciest assignment available fell into Chris' lap in 2379 when his skills as a communications officer were needed on the da Vinci-A which was now the R&D ship of the SCE. 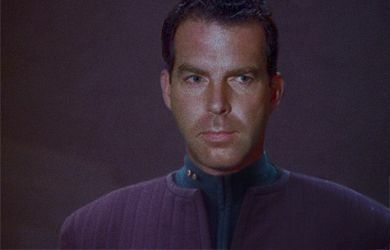 His orders were to ensure Section 31 got their hands on anything that would help with their mission and not get caught.